Product Condition: The Base 3.0 Crew - Men's is in Excellent condition. This item was previously owned for a year. The following observations were made concerning this item. All items sold as is, all warranties void. * Still has a near new look, looks pretty clean. Smells like it may have been washed. May have been worn briefly, likely was tried on. * Comes in the original package. After working up a sweat while you hike for fresh turns, a frisky, cool wind can quickly lower your core temperature and send you running to the lodge. 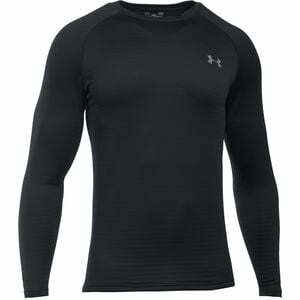 Avoid that scenario with a little help from the Under Armour Men's Base 3.0 Crew. This baselayer supplies enough warmth for cold days on the mountain, absorbs sweat, and dries quickly so you don't feel chilled between runs. Not to mention, the 3.0 Base is equally big on comfort. Snug-fitting four-way-stretch polyester allows you to move with complete freedom, and the flatlock seams ensure you'll stay chafe-free throughout the day. Plus, the anti-odor technology keeps the man-stink away so you can head into the lodge without clearing it out.